My book club made me read "Eat Pray Love," and it's pretty much the worst. Wanna suffer through it? Here's an Amazon link. Elizabeth Gilbert is not a bad writer. In fact, there are certain metaphors, turns of phrase, and structural elements in this book that delight me. She shines in the short form, and dare I say it is obvious that the bulk of her experience prior to writing this book was as a freelance journalist for popular magazines (SPIN, GQ, The New York Times Magazine, Allure). This is not a bad thing. I love writers who excel at the short form and find a way to turn it into long form. But the content is a hot mess. Where do I start? Is it her objectification of the Asian countries to which she travels? The reductive cultural observations? Her cavalier attitude toward those she comes in contact with? Perhaps what got me was her whining about being so tall and blonde (poor thing) that she doesn't blend in during her travels. "Tall and blond and pink-complexioned, I am less a chameleon than a flamingo," she laments. Gilbert recalls her time in China, where apparently everyone stared and a child burst into tears upon looking at her like she was a "pink-faced yellow-headed phantom person." "I hated this about China," she says, and that is that, smugly ending the paragraph with so-called wit. Oh, maybe it's the time she calls someone a "homo." Or maybe it's the fact that she went to India to find spiritual enlightenment. I mean, how "white Western lady" classic is that? At this point, an apologist or optimist might be thinking, Ok, so this is where her fallacious starting point was, but maybe Gilbert evolves? Spoiler: The book offers no true, critical reflection on the problematic attitudes that carry her to and through her trip. I won't fill this review up with all the specific words, sentences, and paragraphs that made me shake my head. You can probably just Google "everything wrong with eat pray love" and find examples yourself. Or fun idea: Read the book and turn it into a drinking game! You'll need to clear your schedule for 3 days in order to nurse the catastrophic hangover. 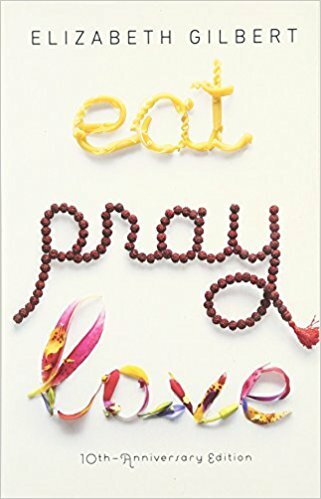 Eat Pray Love is the novelized embodiment of every crappy inspirational meme, narcissistic blog, "let's slum it just for fun" theme party, and destination luxury yoga trip in a third world country. It is yet another example of everything that's wrong with the cavalier, white, privileged, meme-culture feminism that's so prevalent today. I am not knocking feminism, by the way; just this specific brand of ignorant, white-centric, cis-centric, self-absorbed feminism. And for what it's worth, I am also not knocking people who were generally inspired by this book to go on self-discovery trips. That's fine. I understand wanting to shake up one's routine, cleanse the soul, get a fresh start, and exorcize demons. But there's a way to do it more critically, humbly, and sensitively. People who are the right height and complexion that they kind of look halfway normal wherever they go--in Turkey they just might be Turks, in Mexico they are suddenly Mexican, in Spain they could be mistaken for a Basque, in Northern Africa they can sometimes pass for Arab...I don't have these qualities. First off, I don't blend. Tall and blond and pink-complexioned, I am less a chameleon than a flamingo. Everywhere I go but Dusseldorf, I stand out garishly. When I was in China, women used to come up to me on the street and point me out to their children as though I were some escaped zoo animal. And their children--who had never seen anything quite like this pink-faced yellow-headed phantom person--would often burst into tears at the sight of me. I really hated that about China. Note: This review originally appeared on Goodreads.